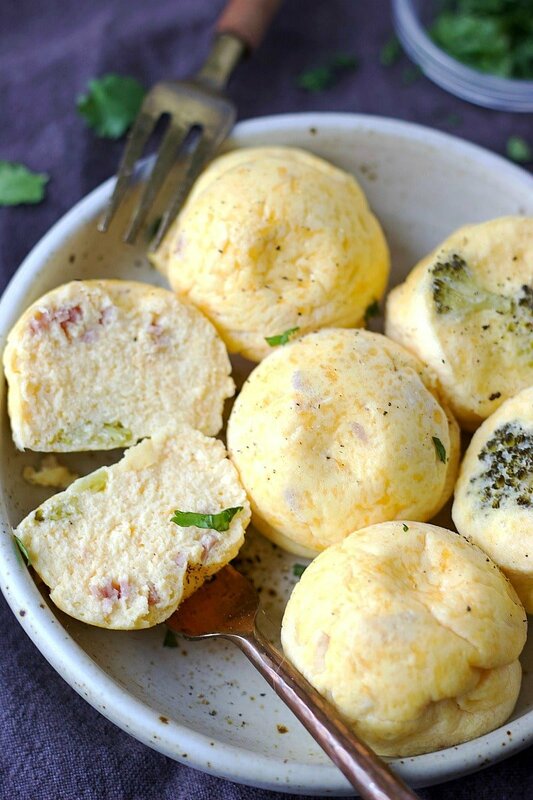 These Instant Pot Sous Vide Egg Bites are super convenient bite-size protein packed healthy breakfast on-the-go! Have you heard? Have you seen? Have you tried?? The new Starbucks Sous Vide Egg Bites!! It’s the talk in town! Only Starbucks to cause such stir over a new drink or food item. But hey, I am a sucker for all things Starbucks so chances are I was the first in line. Hmmm… and they do not disappoint! Adding to their precious menu, Starbucks introduces their “sous vide” egg bites (pronounced “su-vid”, don’t make the same mistake that I did!) in an effort to satisfy their protein craving anti-carb customers. 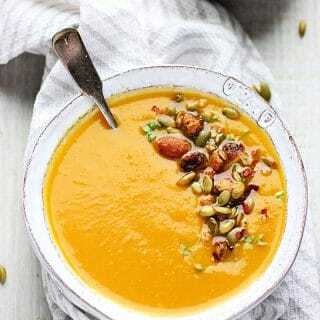 Looking for AWESOME Instant Pot Recipes? Are something I need right now (without paying Starbucks’ price tag!). How To Make Starbucks Sous Vide Egg Bites At Home! Turns out, making sous vide egg bites at home is a lot easier then you think. First you need to get yourself this silicone mold which fits perfectly into a 6qt instant pot. 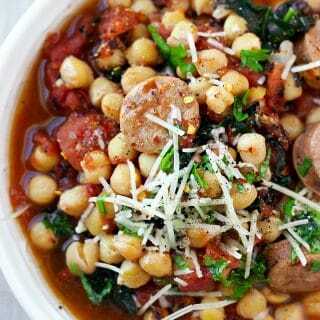 It works if you have a bigger size pot but it will not fit into a smaller instant pot. As for the ingredients you will need eggs, cottage cheese and shredded cheese of choice. I played around with a few cheeses and recommend that you pick cheddar, gruyere or monterey jack cheese for better flavor. Also, I do not recommend you adding greek yogurt in this recipe as it turned out quite sour. Although I am using broccoli and ham in this recipe, some of the other flavors I tried were; sun-dried tomato and spinach, bacon and finally ham and broccoli which is the combination I liked the most. For this recipe we use the “steam” mode for 8 quick minutes then allow for 10 minutes of natural pressure to be released. When you first open the pot the sous vide eggs are all super puffy but they quickly deflate to fill the cavity of the silicone mold. I also found that there is no need to spray the silicone mold with oil or such. The sous vide eggs came right off once they were cooled enough to manage. Now you have your own Starbuck sous vide egg bites with bragging rights my friends! I love how they came out super soft, mega flavorful, they refrigerate so well (even better if you use a stacker bag!!) and you can freeze them too! 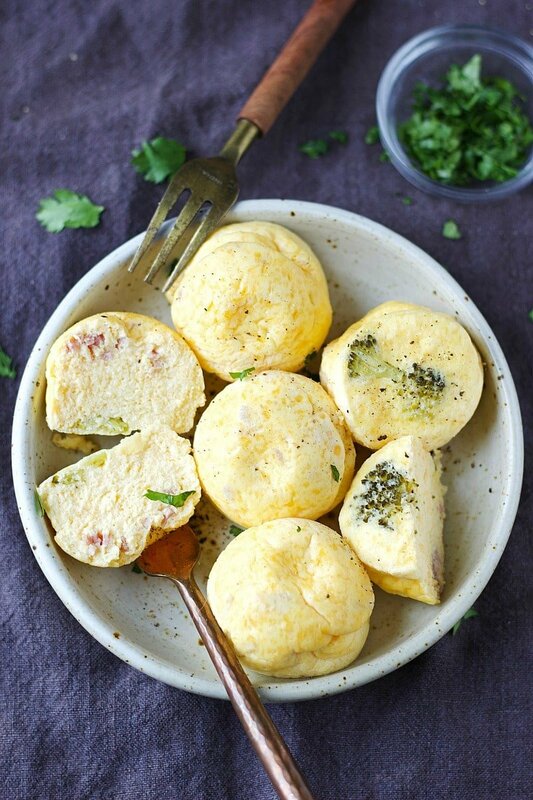 Aren’t these egg bites the most perfect breakfast on the go? They are super convenient bite size protein packed little nuggets. 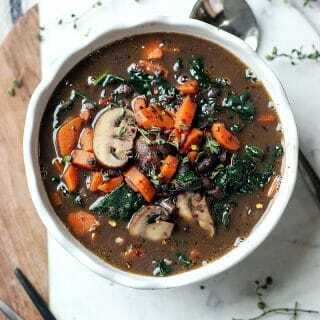 I am so thrilled you are giving this recipe a try! Add 2 cups of water to the instant pot. Place metal trivet on to the bottom of the pot, set aside. Add eggs, cottage and shredded cheese of choice to blender cup. Season with a tiny pinch of sea salt. 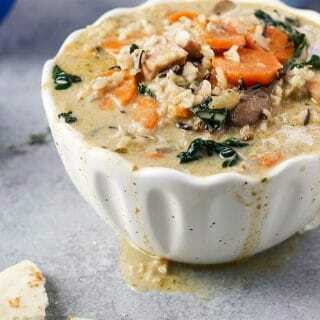 Work it for about 30 seconds or until all ingredients have combined and mixture is creamy. Pour egg mixture into silicone mold, about 3/4 full. Add in pieces of broccoli and ham. Slowly lower the silicone mold into the pot. Close the instant pot and turn venting valve to sealed position. Turn the instant pot on steam mode for 8 minutes. When done, allow for 10 minutes of natural pressure release. Egg bites will deflate some upon opening the pot. Allow it to cool down before removing from instant pot. 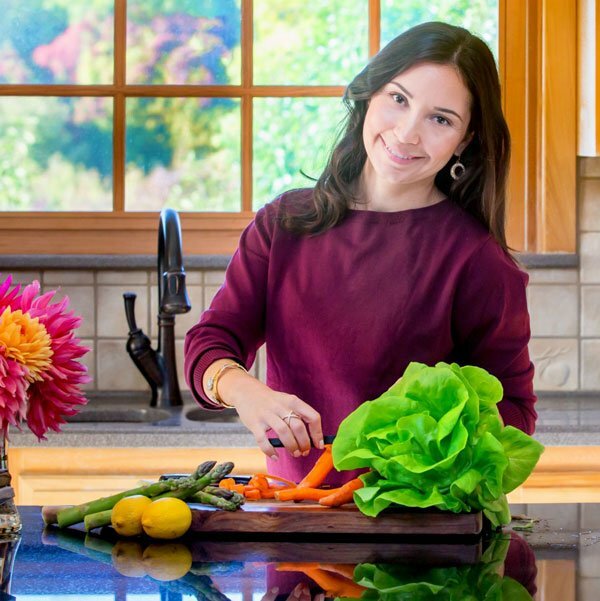 If you make this recipe please share using tag #GardenintheKitchen, I would love to see your creations! I don’t mean to be rude, but while easy and delicious it is not sous vide. So they are pressure cooked, not sous vide. Do you cover the silicone mold with paper towels or foil? The IP lid serves as a cover already. Made these and loved them! We added pesto and cumin for flavor and deleted the cottage cheese and ham. Yes they do! Take them out the night before to thaw in fridge. You can microwave to heat, on a pan frier or steamer. Hope you like them! I’ve never had the Starbucks version so I can’t compare, but these were great. They didn’t stick to the silicone pan, even without greasing first, and not covering them was fine too. There didn’t seem to be too much condensation on the bites when I opened the IP. I added a Pensey’s spice called “Fox Point Seasoning” which is bits of chives, onions, garlic, salt and green peppercorns, which added a nice layer of flavoring too. Thanks for the recipe! I am so happy to hear Carolyn, made my day 🙂 Thanks for the feedback! 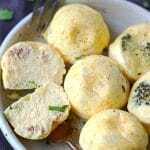 Best egg bites recipe for Instant Pot! It looks as if you use a “Magic Bullet ” and if so, that makes it even easier…love these, great idea. I do take mine with me to Starbucks’ patio…I feel like such a gourmet! Thanks again for such a unique and simple recipe. p.s. I do mince pickled jalapeno and add this in the mixture, it kick’s it up a bit. Is it possible to cook a double batch in the Instant Pot. Your recipe is great for making these bites with one 7 bite baby mold — Now I want to save time and try two 7 baby molds at once? Do you have any advice? Yes you can! just stack them up… although I haven’t done it, others have successfully! Let me know how it works for you. KJCGA – Yes the 21.6 cm (8.25″) moulds are stackable 2 high in the 6 qt Ultra, Plus, Duo and Lux and surely in the 8 qt models as well. First fill and stack your moulds “outside” the IP insert. Place the bottom one on the steam rack by making sure the rack handles can stand up vertically. Place the second mould over the first turning it by a few degrees so it doesn’t sink into the bottom mould cavities, but rather stands on its ridges. No other rack or spacer will be necessary between the 2 moulds. There is sufficient space to allow steam to circulate freely around, over and under the moulds. You’ll still be left with about ± 3.8 ~ 5 cm (1.5 ~ 2″) to grab the handles that are sticking out from the sides of the top mould. Just proceed slowly and carefully as you place the rack and moulds inside the IP insert so to avoid spilling the egg mixture. Removing the moulds is not a problem since the eggs are already cooked and cannot spill over. 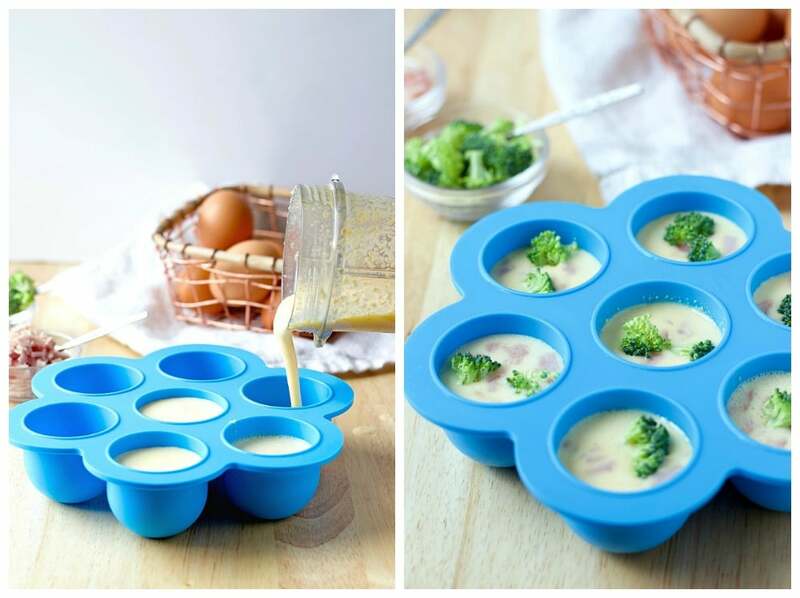 Reminder: You can freeze the egg bites in their silicone moulds after refrigerating them. Once frozen, they can be removed and placed inside other sealable bags or containers to free the moulds. These are SO amazing!!!! I can’t thank you enough for posting this! I made mine with feta, mozzarella, and turkey bacon because that’s what I had on hand. They are DELICIOUS! Super moist, and velvety texture. My new go to quick breakfast! Egg bites are so delicious. I can’t wait to make them again. 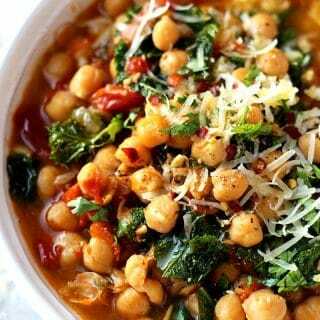 I love the texture and all this flavors with ham, broccoli even with spinach. This is great recipe for breakfast meal. I love it. That’s fantastic, I am so happy to hear that you enjoyed the egg bites recipe! Yes im just wondering about the nutrition info please. Ive made these 3 xs know. I add a bit of spinach and green onion. And i trade off between bacon and ham. I love these. Hi! Do you have to use silicone molds? Could I use oven safe glass containers instead -assuming I grease them first? Hi Jenn, I have made these using a round, glass Pyrex and they turned out great. One thing to note, though, is you may need to increase the cook time as the center of mine was undercooked when I used a 6″ Pyrex (it was fine when I used the 7″ one). I put it back in the Instantpot for an extra 5 minutes and it was fine. I bought the mold you recommend, and have made them twice. Both times, they were very difficult to remove from the mold. Any tips? The second time I used a bit of olive oil spray in each cup. Could it be that I am not letting them rest or cool long enough? Hi Sally, so sorry to hear that. I actually remove mine almost right away and they do not stick at all! Did spray the mold help at all? Gosh, I wish I could help more but honestly I have no idea why they are sticking for you… mine practically jump out of the mold! I have used the small jelly jars since I don’t have a silicone mold. Since they are manufactured to withstand high temperatures for even longer, they work fine,, but make sure you have greased them well. Can you try to explain how they compare to the Starbucks egg bites? I love those and tried replicating in the oven. Bad idea. I like the texture of Starbucks eggs. Starbucks uses the sous vide method of cooking, this recipe is the Starbucks sous vide imitation because I actually cooked them in an instant pot. I don’t think you will get the same results in the oven. They are fluffy and delicious! These came out perfectly and they taste exactly like the Starbucks ones! Thank you!! That’s fantastic Kate, I’m so happy to hear! I make these every weekend. Recipe doesn’t work well with eggbeaters FYI. Texture just comes out wrong. I love these every morning with some avacado. Yumm. 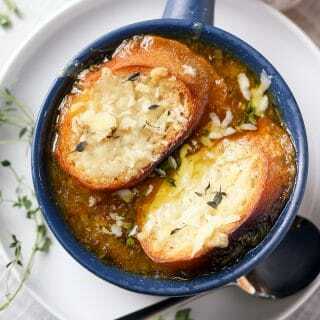 I really love this recipe – Thank you for posting! One tip I would add is to NOT put the rack into the IP after you add the water but instead, set your filled silicone mold on it and lower them both into the pot at the same time. Makes it much easier to lower into the pot without spilling.